* Content directly quoted from Becker’s Hospital Review – Business & Legal Issues for Health System Leadership To view the direct link, please visit Becker’s Hospital Review. Written by Molly Gamble | January 03, 2012 and directly quoted from Becker’s Hospital Review. 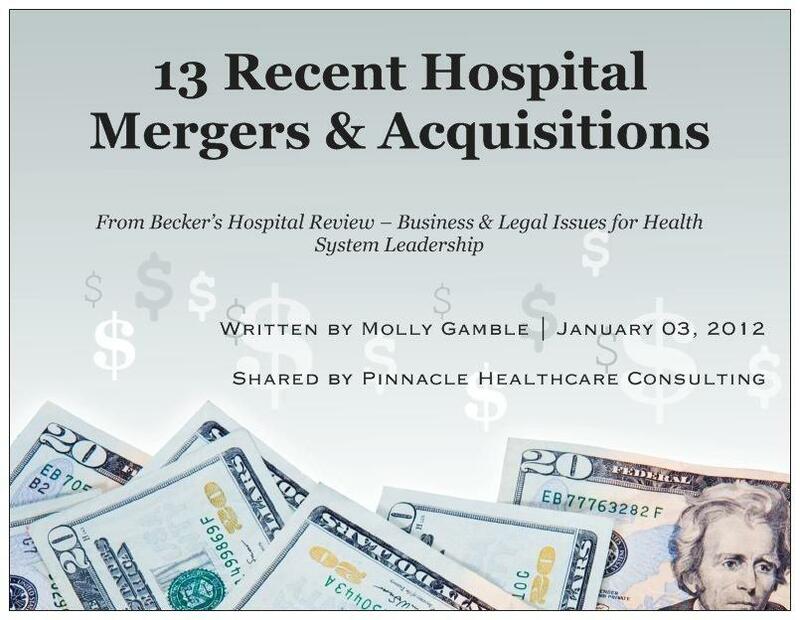 The following hospital mergers and acquisitions took place within the past two weeks, beginning with the most recent. Kentucky Gov. Steve Beshear has rejected a proposed three-system merger between public University Hospital in Louisville with Jewish Hospital & St. Mary’s HealthCare in Louisville and St. Joseph Health System in Lexington, which would have combined a public safety-net hospital with a Catholic healthcare company to create a statewide system. To view the direct link and the rest of the article, please visit Becker’s Hospital Review. From all of us at Pinnacle Healthcare Consulting, At this holiday season, our thoughts turn gratefully to those who have made our progress possible. In lieu of gifts, a donation will be made to United Way and Urban Peak. Thank you for your continued support and best wishes in 2012! Congratulations to Jana Sizemore who recently earned her Accredited Member designation with the American Society of Appraisers in the business valuation discipline! Advancement to Accredited Member is granted after completion of education requirements and approval of full-time appraisal experience, educational background and an appraisal report reviewed by the ASA’s Board of Examiners. Our knowledge of the broader healthcare industry adds valuable insight to the risks and benefits of either a sale or acquisition. We ensure that you enter a transaction fully informed. 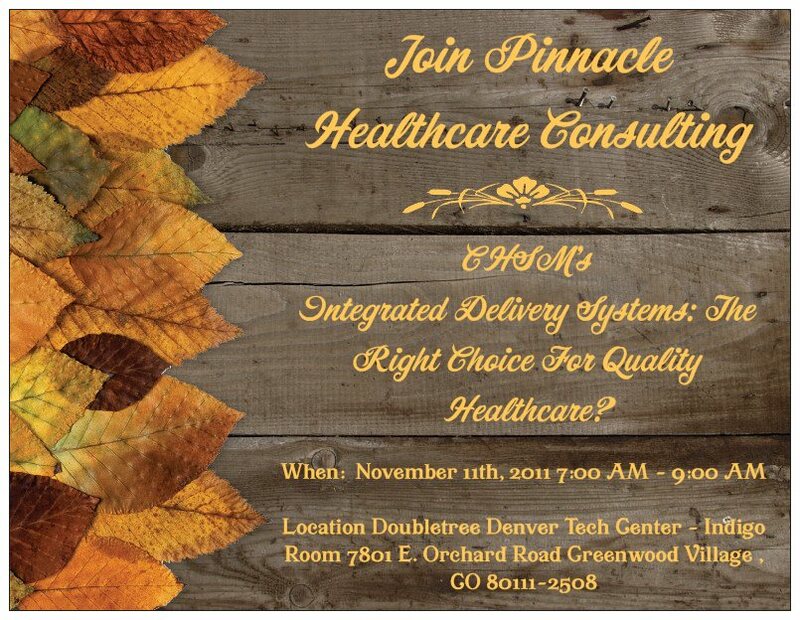 Join Pinnacle Healthcare Consulting at CHSM’s – Integrated Delivery Systems: The Right Choice For Quality Healthcare? 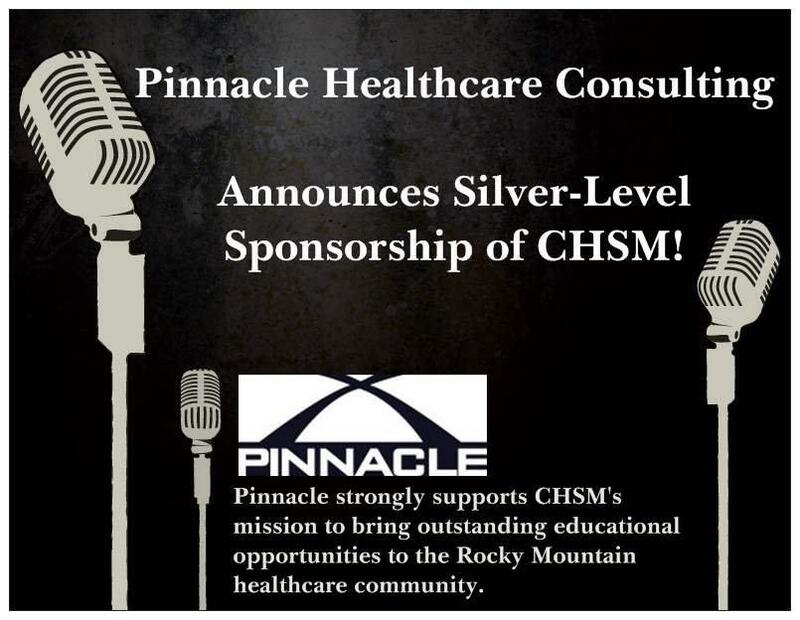 Pinnacle Healthcare Consulting is pleased to announce our recent participation as Silver-Level Sponsors for Colorado Healthcare Strategy and Management (CHSM). Though our sponsorship, we continue to support CHSM’s mission to bring outstanding educational opportunities to the Rocky Mountain healthcare community. Join Pinnacle Healthcare Consulting at CHSM’s next event: Integrated Delivery Systems: The Right Choice For Quality Healthcare? Healthcare reform and modern-day economics are sparking a renewed drive toward integration of care into one seamless team providing the right help at the right time. While integrated delivery systems (IDS) promise higher quality care, lower costs, and competitive advantages, the results have been mixed. In Colorado, however, three organizations have been operating successful integrated healthcare systems for more than a decade. Join us as executives from Colorado Springs Health Partners, New West Management Services Organization and University Physicians discuss clinical integration strategies, key success factors, and the challenges they face in the brave new world of healthcare reform. Don’t miss this important event! Ruth N. Benton, MBA, CEO, New West Management Services Organization, Inc. and New West Physicians, P.C. Elizabeth D. Kissick, MBA, Director of Health Plan Development at University Physicians, Inc. Registration: Breakfast and Networking 7:00 a.m. – 7:45 a.m. Presentation: 7:45 a.m. – 9:00 a.m.
Ruth N. Benton, MBA, CEO, New West Management Services Organization, Inc., New West Physicians, P.C. (collectively, New West) is the founder and owner of New West, a primary care group practice. The company has grown to $50 million in revenue with 300 employees in 17 locations in the Denver area. Previously, Ruth served as the vice president for HealthOne, HealthCare United, and HMO Colorado. For the past five years, she has been one of Denver Business Journal’s “Most Influential Health Care Leaders in Colorado”. Deborah L. Chandler, MBA, CMPE, EVP/CEO, Colorado Springs Health Partners, has over 25 years experience in multi-specialty group management and administration, including over 10 years as CEO for Anchor Heatlh Centers in Florida. Debbie serves on the boards of Colorado Springs Regional Economic Development, the Greater Colorado Springs Chamber of Commerce, Community Health Partners, Pikes Peak Workforce, and Southern Colorado American Heart Association. Elizabeth D. Kissick, MBA, Director of Health Plan Development at University Physicians, Inc., a not-for-profit corporation supporting medical services operations for the clinical practice of the University of Colorado School of Medicine. She oversees all commercial contract transactions, rental network development and management, and business activities associated with population management within a faculty practice plan. Previousy, Liz served as Senior Manager for Managed Care at Johns Hopkins Medical Services Systems. Stay informed with what Pinnacle Healthcare Consulting (The Pinnacle Group) is reading in relation to current events and topics within the healthcare industry. Last week’s Medical Group Management Association conference in Las Vegas featured four days of workshops, networking, and almost 100 sessions devoted to the challenges facing physician groups as they attempt to navigate the business of healthcare reform. 1. The healthcare reform train has left the station. If you’re sitting around waiting for the final court decision on healthcare reform before investing in electronic health records or exploring different payment models, then your practice is so far behind that it may never catch up. The feds have been pumping some serious dollars into demonstration projects and other initiatives to help physicians and hospitals develop the infrastructure to compete in the new world of healthcare. Even providers that don’t participate in these projects are aligning themselves with other providers and payers to develop healthcare delivery systems and payment models that move patient care from volume to value and focus on higher quality and lower cost care. Through these partnerships, providers and payers are putting processes in place to collaborate, develop clinical engagement, and manage transitions of care. Healthcare has changed and it will not return to the old way of doing business. 2. The physician-patient relationship is in flux. Physicians tend to make many treatment decisions for their patients, but implementing new healthcare delivery systems that emphasize collaboration will require patients to be more engaged in the decisions that affect their medical care. Studies show that, all things being equal, patients tend to select less invasive and less expensive procedures when they have the tools and information to assess the trade-offs of different treatment options. That means the physician or the staff must take time to provide the resources a patient needs to make informed healthcare decisions. I predict physician practices will adopt a common practice of pushing decisions and jobs to the lowest level possible. A physician’s time will be reserved for patients who need more intensive care and physician assistants will handle more of the everyday medical cases. E-mail, once health plans agree to reimbursement terms, will play a larger role in patient-physician engagement. 3. Physicians have a role in incentivizing patient behavior. My insurer tells me that I can earn $50 just by completing an online health risk assessment. I still haven’t taken the time. But what if my insurer put some real money on the table and got my doctor involved in the process? One insurer offered $1,000 for family members to complete an HRA, review it with their primary care physician, and then develop and follow a medical care plan. Its HRA completion rate jumped to a whopping 80%. By engaging physicians and adding a medical plan, this insurer added real value to the HRA. 4. Healthcare will be important to economic development. Employers will send their jobs to cities and states that support a robust healthcare industry with sufficient providers. Some companies are already taking healthcare services into consideration when they look at facility locations. Employers are becoming more aware of how healthcare price competition and availability of medical services can affect their workforce and their bottom line. 5. Making a list and checking it twice isn’t just for Santa Claus. Physician offices can benefit from developing checklists for even routine activities. A checklist clarifies a process so the same steps are taken each time. It establishes priorities, makes sure everything that needs to get done gets done, reduces errors, and can help the physician office staff function better as a team. It’s a relatively simple effort that can save a practice time and money. These hot topics will change the practice of medicine for years to come. If you were at MGMA, or even if you weren’t, what’s your take on these big ideas? (Please send your ideas to kberkey@pinnaclegrouphc.com and Pinnacle Healthcare Consulting will post your responses on our blog! 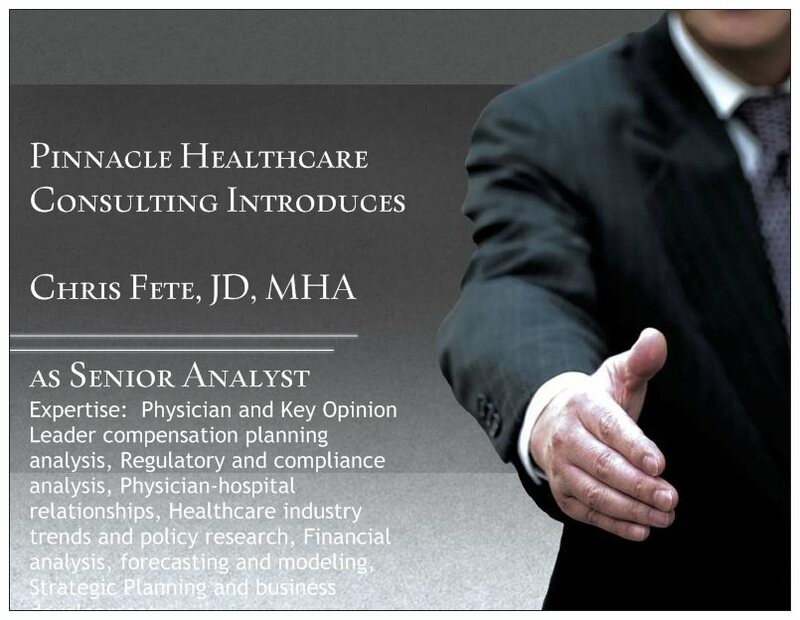 Pinnacle Healthcare Consulting proudly introduces our newest team addition, Chris Fete, JD, MHA. Christopher joined Pinnacle Healthcare Consulting in 2011. As a Senior Analyst, he supports Pinnacle’s consulting engagements including fair market value reviews of physician compensation, Key Opinion Leader analysis, business plan development, financial and market analysis, community needs assessments and physician practice start-up / management assistance. Prior to joining Pinnacle, Christopher was an administrative intern for a children’s medical center in St. Louis, MO. As a team leader, he assisted in the development and organization of a patient access-line for Maternal Services between two hospitals. In past positions, Christopher served as a clerk in the states of Michigan and Missouri. He assisted attorneys in all aspects of trial preparation, memorandum and analysis of complex legal issues related to medical center operations. Christopher has researched and prepared service arrangements, employee contracts, as well as compliance issues specifically related to Stark Law, False Claims Act, Fraud and Abuse, and Anti-Kickback Statutes. He has additionally reviewed and analyzed university agreements with physicians, pharmaceutical companies, and service providers. In his free time, Christopher enjoys participating in outdoor activities such as mountain biking, kayaking, camping and hiking. He additionally enjoys lending a hand with community service projects and was an assistant high school varsity lacrosse coach for several years before moving to Denver. Pinnacle Healthcare Consulting Welcomes Two New Additions! 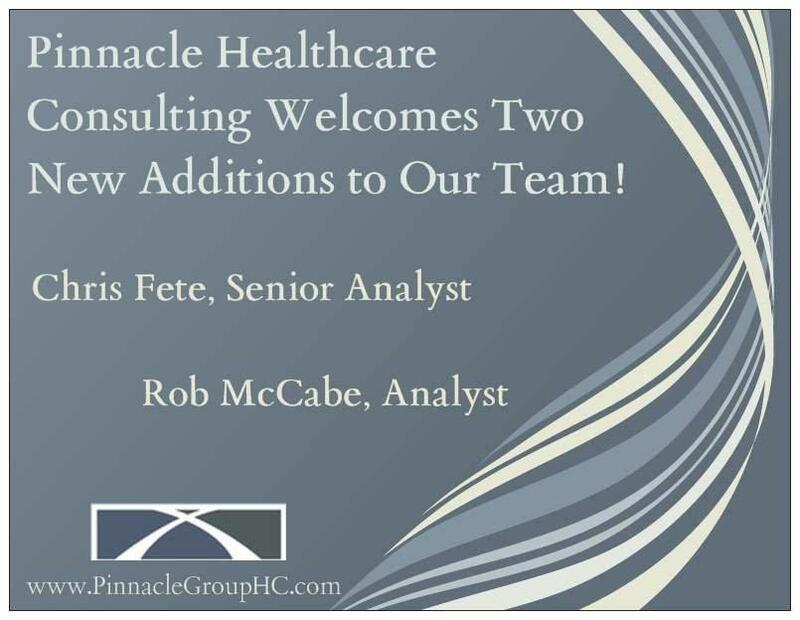 Pinnacle Healthcare Consulting is excited to extend a warm welcome to our new Senior Analyst, Chris Fete and Analyst, Rob McCabe. We are thrilled to add two new key additions to the Pinnacle Team as we continue to enhance and develop our service offerings. Chris and Rob will assist Pinnacle Healthcare Consulting in the development of analytical models, perform market analysis / research, and support in report letter development for advisory projects in the healthcare industry, which includes hospitals and health systems, physician groups, ancillary clinics, publicly-traded companies, etc. They will additionally contribute to and support healthcare related projects, physician compensation, employment arrangements and complex contract arrangements. Please be on the lookout for their individual company biographies and expertise in the near future! 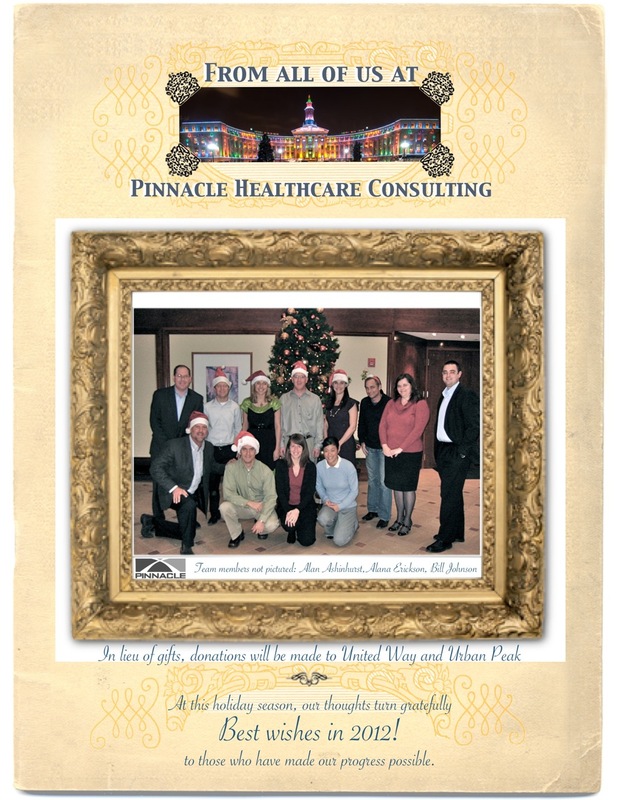 Announcing a New Addition to Pinnacle Healthcare Consulting! 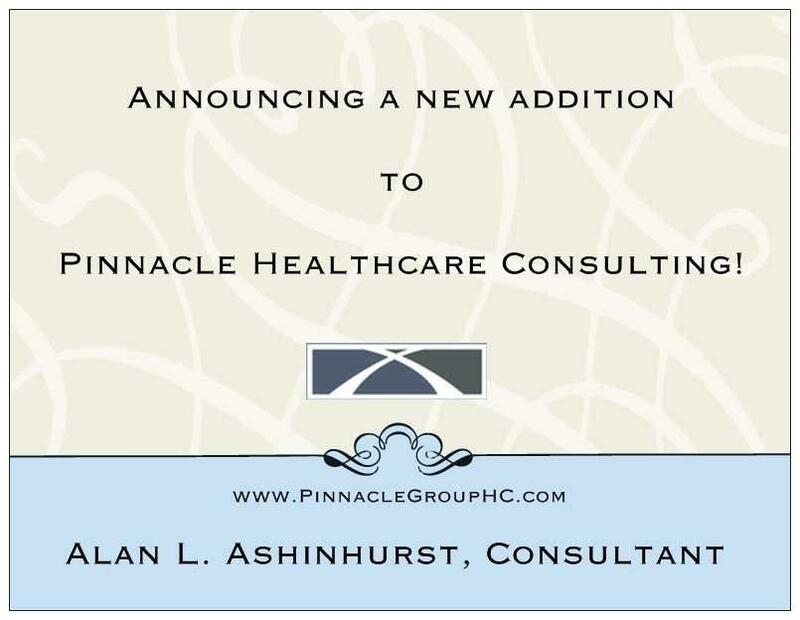 The Pinnacle Group would like to welcome Alan Ashinhurst, consultant for Pinnacle Healthcare Consulting, joining in 2011 after two years as a practice administrator for a multi-state urgent care facility. He brings with him multiple years of experience in various healthcare fields and positions to assist hospitals and physician offices with clinical and management needs. His expertise includes practice management, technology – electronic health records (EHR), and process and efficiency improvement. Alan’s focus on managing physicians, staff and community relations brings a level of understanding and expertise to Pinnacle Healthcare Consulting in an operational capacity within the Coding and Audit Division. Alan has a strong clinical background, working as a Radiologic Technologist in diagnostic imaging, endoscopy, special procedures, a traumatic burn unit as well as a sister company of The Pinnacle Group. Alan has additionally worked as an admissions clerk in an Emergency Room and a ward clerk for a Post Anesthesia Recovery Room, giving him several years of hands on experience in patient care and customer service. He received an AS in Radiologic Technology and BS in Health Services Administration from Washburn University. With a 300% average ROI and powerful tools to help make defensible decisions about physician relationships, the Physician FMV Program helps take away the CRABBY and makes determining physician fair market value look like CAKE! 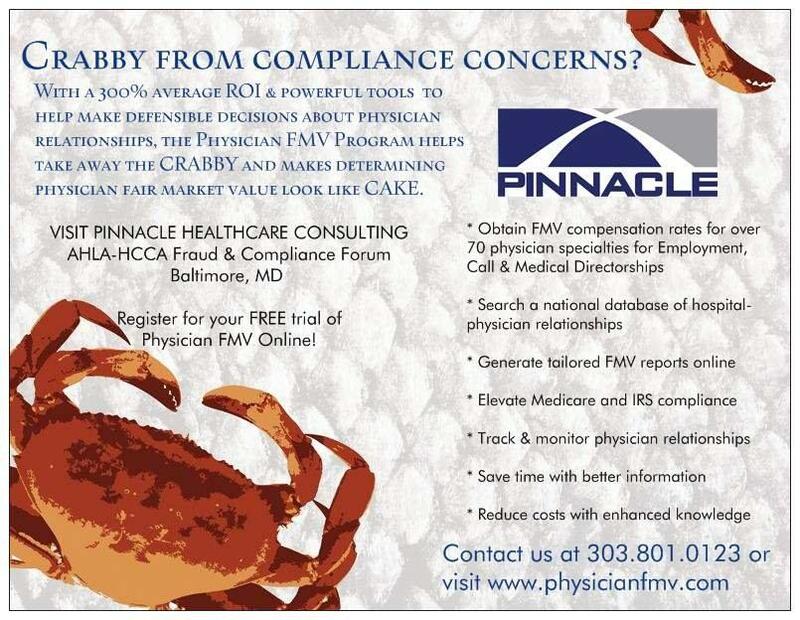 Visit Pinnacle Healthcare Consulting at the Upcoming Fraud & Compliance Forum! The Fraud and Compliance Forum is jointly sponsored by the Health Care Compliance Association (HCCA) and the American Health Lawyers Association (AHLA). It will include an explicit designation of a session as ‘compliance focused’ or ‘legal focused.’ The Fraud and Compliance Forum has the benefit of combining the quality of HCCA and AHLA sessions with the expanded networking power of a combined program.